With planning well under way for Cornwall Helen and are turning our attention to August and a possible two weeks in Eire. Having never been to the beautiful South I have no idea where I should be looking as a base. I would welcome suggestions as to where we should be looking for accommodation (self catering), the best bits of Ireland, the most easily accessible summits, other things to do etcetera. Basically any thing that may help. One area of concern is something we read that said Satnav and GPS are frowned upon over there. What is the position and what do they mean by frowned upon? The South (Eire, Republic of Ireland, the Free State etc) is nice. However, the North (Northern Ireland) is nicer. The beaches, hills, people, food, drink, scenary etc in the South are good; all are even better in the North. Don’t rule it out. You could experience a bit of both by visiting County Donegal. It is in both the Republic of Ireland, and Ulster. Wherever you go, don’t forget to try the traditional breakfast - the Irish breakfast with black and white pudding in the South, or the Ulster Fry with potato cake, soda bread and pancakes in the North. And make sure you are equipped to post to SOTAwatch via SPOTlite to guarantee the pile-ups! Glad to hear that you’re thinking of coming to Ireland. When you’re on this side of the Irish Sea, why not pay a visit to Northern Ireland? There’s certainly no problem with Satnav or GPS here - both are widely used. I’m sure the same is true in the South. I have spent some time in Northern Ireland with work but have never been to the South which is why we wanted to give it a try. I would also like to visit Bunratty Castle (if you look up my details on QRZ and the history on the castle you will see why). However plans are very capricious and any suggestions will be considered. The idea of a border property is being thought about and the possibility of operating both as GI and EI/G is an attractive one. If that does not happen a GI trip may well be on the cards for next year. I am sure you are right about the GPS but I have read some slightly cryptic things on the net. Nobody so far says they are illegal but that they are frowned upon. I thought it might be something along the lines of the perceived problem with mobile phones as a distraction to the driver. I would have thought getting lost and trying to read a map while driving was more of a potential hazard. Getting lost tends to make people frustrated and angry leading to possible errors in judgement. Where ever we end up I will look forward to working you from a few summits. with mobile phones as a distraction to the driver. What about those that are built-in the car? Allowed everywhere but Eire? I don’t think so. It’s not a specific an offence to read a map whilst driving in the UK. But you can, at least, be prosecuted for driving without due care and attention. Possibly other charges too. Likewise, using a GPS, fixed or handheld, or fiddling with the car radio or eating an apple or anything else. If you’re not concentrating on the driving you’re not driving with due car and attention. Must go, I almost dropped my donut in my coffee cup then when I needed to change gear, steer and type at the same time. Some idiot young woman using her rear view mirror to apply her lipstick had to brake hard to avoid the guy using his mobile fax machine who wasn’t looking where he was going! And all this while travelling at 85mph in Force 8 winds and a snow storm on the M8… don’t you just live life on the edge! P.S. Just a thought for Steve if you are thinking about mobile operation… are there any issues relating to this in Eire? For what it is worth, my wife and I did a complete coastal circumnavigation of Ireland, North and South in 2005. If I was an activator, which due to limited mobility, I am not, I would narrow the possibilities down to 2. Ireland West (IW) or Ireland South (IS). IW has 87 summits ranging from 1-10 pointers, none of which has ever been activated. A good base would be the town of Mayo, but self-catering abounds in the area closer to the summits. On reflection, my choice would be IS which has 131 summits of which only 13 have ever been activated. Tralee could be a good base, but the main reason for my choice is the Dingle Peninsula, and the town of Dingle has plenty of B & B etc. It is close to the place where the film ‘Ryan’s Daughter’ was made and the peninsula has breathtaking scenery. We would willingly have stayed a week there and not have seen it all. Regarding SatNavs/GPS, my Toyata has it but here were no Irish CD’s available back then, but I have never heard of any problems. Suggest you contact an EI to check. A good ferry route is Cairnryan to Larne… nice and short if it is choppy!!! BTW Tom, I have many Irish friends who would cringe to hear that Co Donegal is in both GI and EI. Had you said it was in the northern part of Ireland you would have been OK, but it is most certainly in Eire. Not guilty David. I said Co Donegal is in both the Republic of Ireland and Ulster - and this is true! Yes Tom, you are, of course, correct. However, Ulster disappeared in 1921 when Donegal, Cavan and Monaghan voted to join the Free State, and it is only the NI politicians who continue to use it as a throwback in history. Sorry to misread you. The people of Co Donegal firmly believe they are part of a different country, having voted to be so at the separation. I would dispute that Ulster has disappeared David. Ulster - the nine northern counties of Donegal, Monaghan, Antrim, Derry, Down, Armagh, Fermanagh, Cavan & Tyrone (6 in GI and 3 in EI) - still exists in the organisation of sport (particularly GAA - Gaelic Football and Hurling), and of course in tradition and history. The Ulster Fry is served throughout Ulster, whether GI or EI, so the concept of the Province isn’t dead yet! I am kind of disappointed at the encrouchment of politics into Amateur Radio - isn’t that the one thing that hsould be removed from radio!? The operation of in-car GPS devices in the republic of Ireland, downhere, are, as far as I am aware, completely legal. What is not legal is the operation of cellular mobile telephones - those devices that provide two-way communications via a cellular network. As far as I am aware, the use of two-way amateur radio equipment is legal in moving vehicles. I have been stopped at Garda (police) check-points, and have never been asked questions about the radio in my car/operation of it etc. 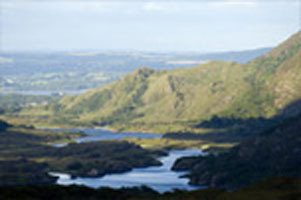 As to which area of the island of Ireland to visit, that depends on what you are looking for. The northern section of the island (Donegal/Sligo/over to the north-east area) is very beautiful, lots of nice people, summits, and plenty of nice pubs. If you are looking for some information on the south/south-east or east, you can let me know, as they are the two areas I know best. Unfortunately our EI trip is being put back until next year, but any information would still be welcome and I will file it for the future. It is still firmly on the cards but we will be in Scotland in August instead. Well thats a pity. Regarding Scotland, I have no idea. Just been there 2-3 times. Regarding your trip to Ireland, I suppose a beginner for you would be to make a decision on, where, it is you want to go. Most Irish tourism sites are broken down into the four provinces: Munster (Southern counties of Ireland), Leinster (Eastern counties), Connaught (western counties) and then Ulster (northern counties including Northern Ireland). There is always support provided by amateur radio ops for this festival. I have visited both the North and the South and the place is amazing. The people of GI and EI are very warm and welcoming people, so wherever you go you will enjoy every minute. I found that life in general is much more laid back and relaxed in the south. On my last visit I stayed in a small village called Kilcoole which is South of Dublin and just East of Wicklow. The village has a pub called thje Molly Malone which is used to film the Eire version of Emmerdale. One thing for sure Steve, you will be amazed by the scenery, North and South. LOL! The Irish version of Emmerdale - thats exactly what it is. The show was called Glenroe. It had been running (in different names) since the late 70s. I didn’t know the Molly Malone was still there. Indeed, there is plenty of good places, both south and north of the border. Steve, let me know closer to the date and we can help you out again. Ah, thanks for the links Bernard, that brought back some fond memories and you already answered my next question…Joe Lynch, hi. Joe and the reast of the cast’s photos adorn the back of the bar in the Molly Malone.